American’s Best Firehouse Chili Recipe has been announced and chili fans are salivating over the winning recipe. As fall weather hits, bowls of chili are hitting the table. Hormel Chili brought together a group of men who know chili, firefighters. Firehouses and chili are a classic combination. In this chili recipe competition, Hormel Chili not only celebrated delicious chili recipes but also honored fallen firefighters and their families. For the second year, Hormel Chili brought together five finalists in a live chili cook-off to determine which firefighter had the best chili recipe. The event was held at the New York City Fire Museum. 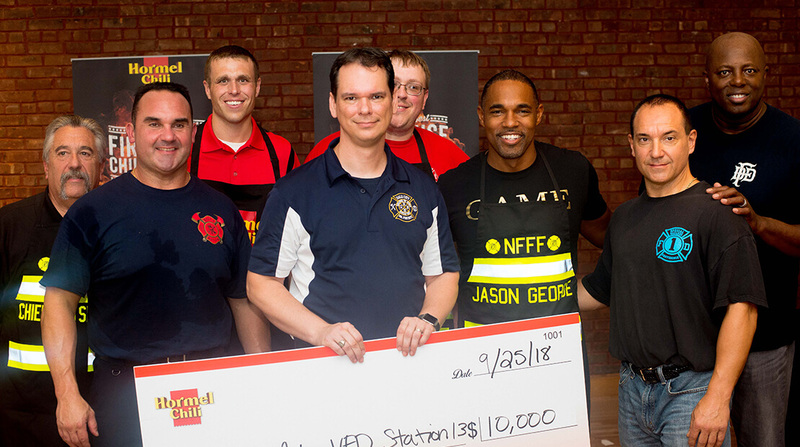 In addition to the $10,000 prize to the winner, Hormel Chili donated $20,000 to the National Fallen Firefighters Foundation (NFFF), which honors fallen firefighters and their families. While Dumire’s recipe name is a firefighter reference, his winning recipe brought a smoke flavor to his chili. The chili had a smoky brisket, smoked corn, bacon and chipotle peppers. While the smoke flavor is apparent, it doesn’t overpower the layers of flavors in the chili recipe. The smoke adds depth and nuance, which every chili needs. With his prize money, Dumire plans on using the money to fund the Dale City VFD Foundation. This holiday event has Santa, in his fire truck, visiting terminally ill children and their families. The participants bring gifts, sing Christmas carols and hopefully lighten families’ spirits during the holiday season. Although Dumire won the title America’s Best Firehouse Chili Recipe, the other recipes were quite impressive. From a turkey chili to even a crab chili, these recipes show the versatility that chili offers. While the firehouse can make one big batch for the whole company, each individual firefighter can customize his bowl.